To be honest, I’m not a culinary person. I prefer eating bread in order to save my money when I travel. But again, travel won’t be completed without tasting the local dishes. Eating in a restaurant? No, I won’t. Street food is all I look for to buy cheap yet local favorite food. As you know, I was just been in Philippines so I’m gonna share five unique dishes that I found in Philippines. If I had to describe Philippine’s dishes in a word, I would say, “un-fibrous”. It’ very hard to get veggies in any food stalls in Philippines. They love meat a lot, especially pork. Tosilog, Tapsilog, Hamsilog, Sisilog, all those words ended with “silog” words is exactly what I found in the food stalls everywhere in Coron. The idea is just the same, a simple rice fried with garlic, an egg, and a meat. Tosilog, or pork is my favorite, I ate this a lot in Philippines. The redish pork tastes sweet and savory. I think the meat itself can be easily bought ready in supermarket. A dish consists of complicated components such as pork’s snout, ears, jowl, and liver. It is normally served with an egg in a hot plate. 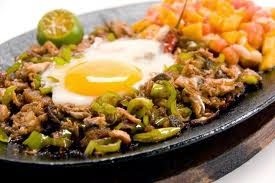 Sisig is a side dish for alcohol drinking. Nowadays, the innovation of Sisig made of other meats like frog and ox added the flavor. Halo Halo saved me from Philippine’s heat. A cup filled with colorful jelly, ice cream, beans, and fruits. There are similar dishes like this in some parts of South East Asia. Philippines is influenced by Spanish in terms of food as well. Empanada, a bread made by folding dough can be easily found in Philippines. Different region has different style of Empanada. 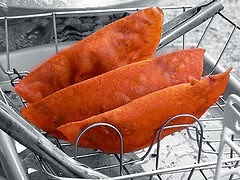 The popular one is Ilocano Empanada, filled with papaya, chorizo (sausage), and the deep fried makes it crispier. Last but not least, the most disgusting food I’ve tried so far, Balot. An egg with almost born chick inside, euh. Can you see the blood vessel? After convincing myself, I manage to eat it. It tastes like salted egg with special crunchy sensation. I didn’t know how to eat it so I just eat all of it. But after I met my Filipino friend, she told me that the delicious part is drinking the broth inside the egg and the yolk. Normally they throw other part. Dare to try? If you think the post is useful, kindly share this information by clicking the logo below. You’ll be directed to your facebook or twitter. No. 1 looks like Nasi Lemak. Lol. And halohalo, I have tried before back home in Malaysia but never knew that it is Phillippines'! Jayexiomo: Ya sisig is very yummy! But still tosilog is also my favorite haha. I will never taste balut anymore. Yea it does look like es campur.. or ABC. haha..
Havent tried Lechon Kawali but sounds nice. will definitely try it. Thanks! COPYRIGHT 2017 LITTLENOMADID | ALL RIGHT RESERVED.